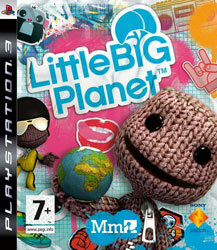 While I may not have thought LittleBigPlanet to be the revolution that certain circles had been hyping it as, that’s not to say that it wasn’t a great game and a step towards popularising what still has the potential to almost be a genre in its own right. I have to say that, at least back when I played it, creating my own levels and playing what was out there was the least appealing part. Unsurprisingly, most of the user-created levels were complete tosh, and when it took me a couple of hours to make what I thought was a fairly basic element to an even passable standard, I decided that a controller just isn’t the interface to use when getting creative. I’ll go back at some point and see what people have made when given the time to work around the limitations of the tools, but I had a good enough time with the story levels to let this game into my top ten. Knowing that Media Molecule’s levels were created with the same pieces that anyone else can use, it bodes well for the future of LBP because I thought it was one of the best traditional platformers that I’ve played in ages. Yes, the controls are floaty and can feel imprecise. But as a whole those levels were so creative and made such good use of what the game had going for it – namely a great physics engine and a wonderful handmade visual style – that it was impossible not to love them.